The first of many! With Vegas being a 3 hour drive/ 1 hour flight from LA it’s easy to see why people say it basically counts as California still 🙂 For us, it’s likely to be a meet up spot for friends coming over, but do you really need an excuse for Vegas? We flew out on Friday night with American Airlines. What a painful experience! Delayed for 2 hours! The delay itself is annoying but pushing back the departure time every 30 mins when they know we have no crew? Annoying. Next time we are just driving, I think it probably takes just as long once you factor in waiting at the airport. We got in late, making it just in time for Calvin Harris at Omnia. Luckily we were meeting a group there so we could bypass queues and door fees ($50 for a girl, $150 for a boy) and head through to our balcony table. This is definitely the way to do this! Private area and table service with little drawer under the chairs for your bags. I’m not sure how I’m supposed to go back to a normal lifestyle after my VIP experience. CH played all his great songs and in no time it was 4 am club close time. I’ve seen Calvin at 2 Coachellas: 2014 and 2016. He was great at 14 but I remember being disappointed in 16 so I was stoked that he played a good set. Plus we were catching up with a friend we hadn’t seen in 7 years. Talk about excitement overload. 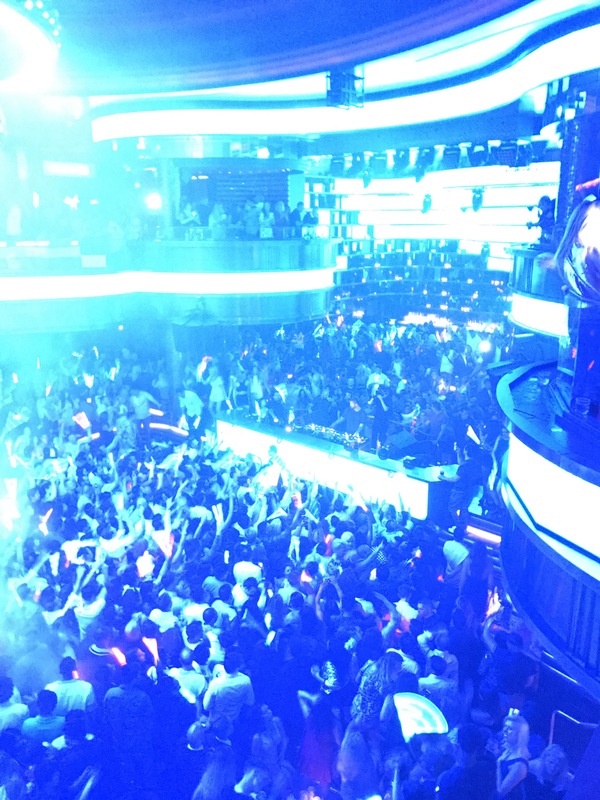 As a venue Omnia is pretty good. It’s not too big but it is rammed full of people. I think the door prices probably reflect how hard it is going to be to get to the bar, unless you are doing bottle service. Saturday was spent lounging around with everyone having to recover (that’s what happens when you get home at 7 am). 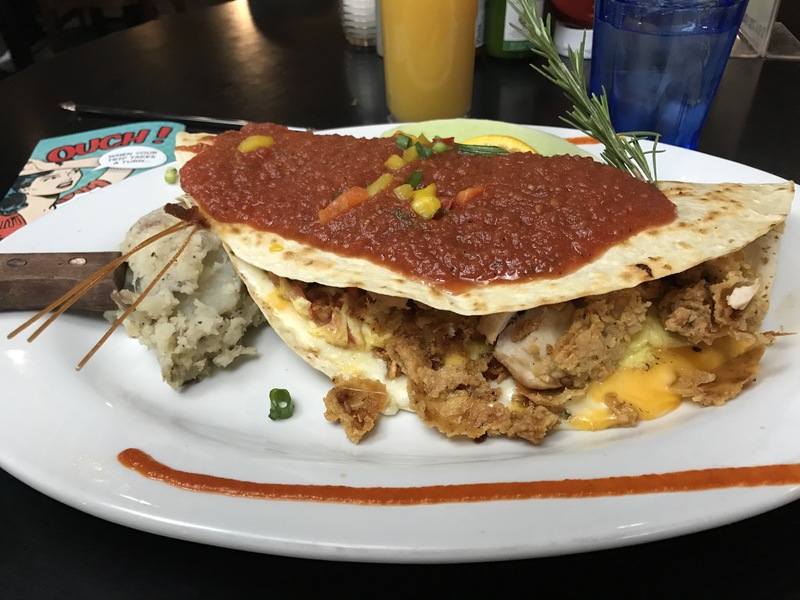 I am blessed with minimal hangovers so while Al was unable to drag himself out of bed I went down to Hash House A-Go-Go. 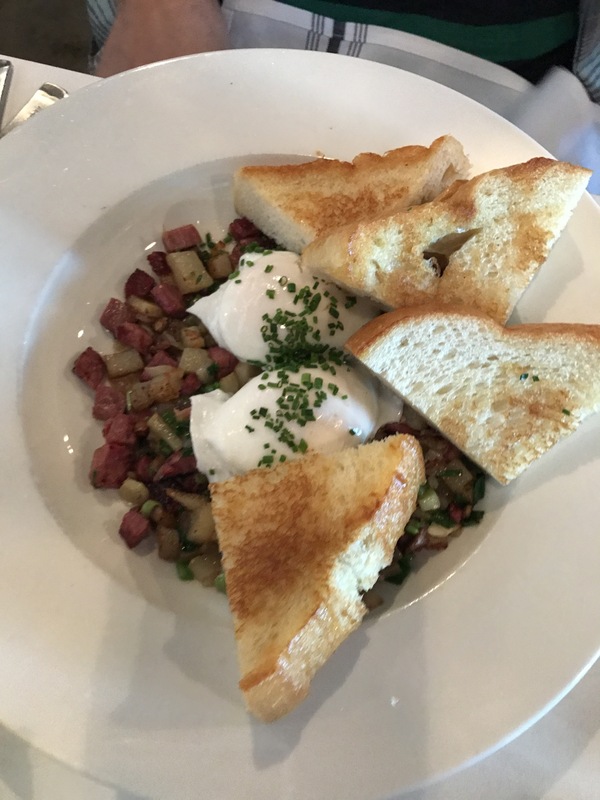 I’d been here before so Al could try a man v food breakfast and knew they served up a good one, plus we were staying at the Linq and it was an easy option. I went for the quesadilla with fried chicken. My god this was massive, and tasty. You can get it without the fried chicken but I’m not sure why you would. There is no chance of finishing a plate here, I’m sure of it. Here are my leftovers – I think I managed half which was still a massive amount. There was someone stuck in a hangover duvet coma who was pretty happy that it made it back to the room. 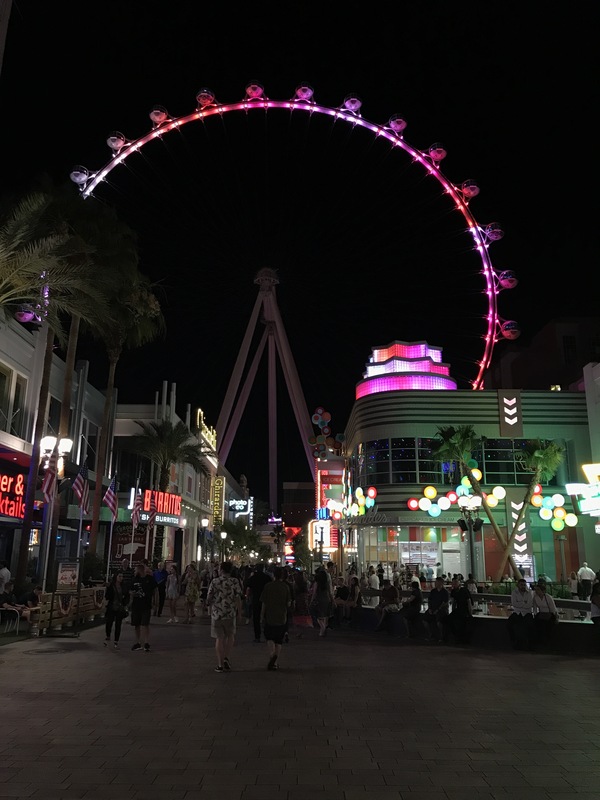 As for the Linq itself? Not bad. 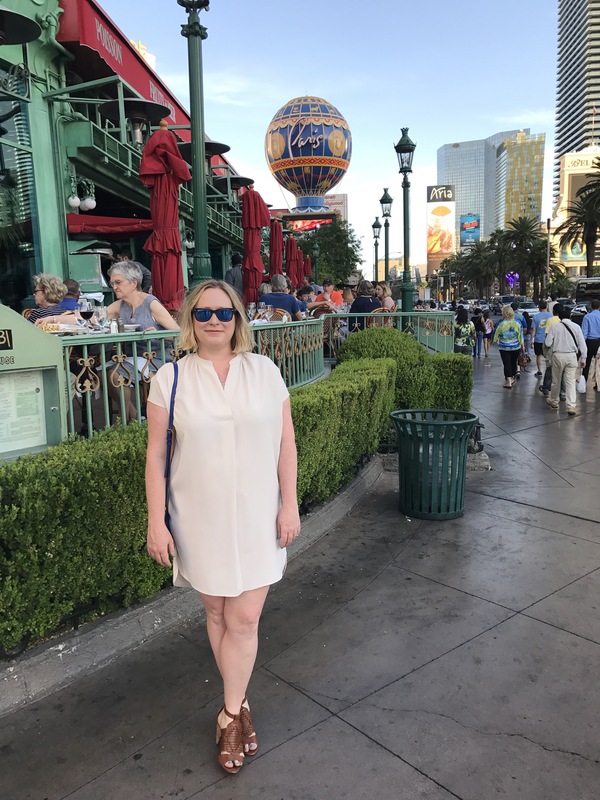 We’ve stayed at the Flamingo, Treasure Island and Planet Hollywood (I know what you’re thinking ‘gees she’s fancy’, and yes I obviously am 😜) I think the rooms at the Linq have been the nicest. Weirdly we never ended up gambling here though so not sure about that. The pool isn’t big but it’s good. 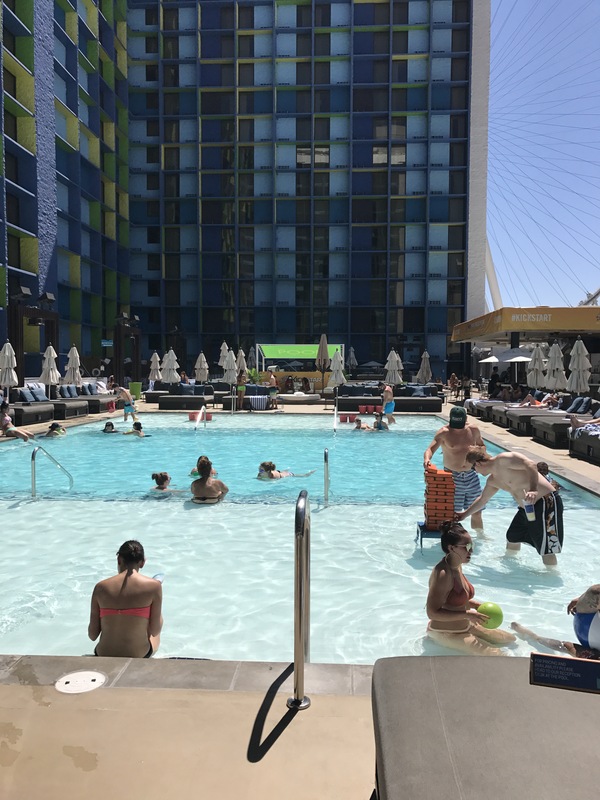 There are games to play and it feels like a balanced amount of sun loungers to pool – not like Planet Hollywood where it feels like you might be in a car park. 2. Dinner at Momofuku at Cosmopolitan. The bao buns here are really good, so light and fluffy. I tried the shrimp and really wish I’d grabbed the chicken karaage as well. I also got the chilled spicy noodles. This is a massive bowl, not very spicy. But in good news the Sichuan sausage is really good and there is heaps of it in the bowl. 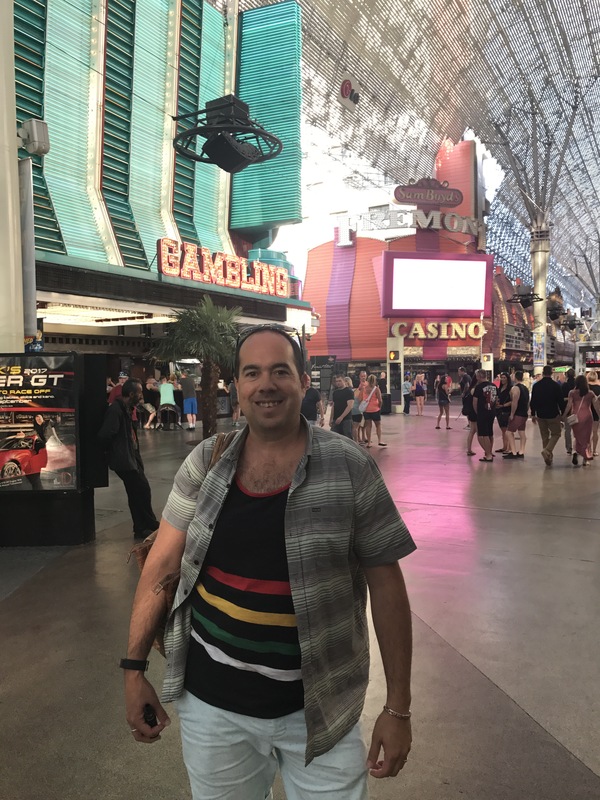 When I go to a Vegas I like to head down to Fremont, at least for a bit. This trip, it was a perfect Sunday afternoon thing to do as our flight back wasn’t until the evening. First stop was Eat on Carson. This is such a great breakfast spot. If you have to queue a little, do it. They turn over tables relatively quickly and the food is phenomenal. One of the specialities here is the fried deviled egg. While I didn’t have them this time I have before. Order them, they’re delicious. I did, however, order the truffle scrambled eggs. Beautifully done with the truffle not over powering the dish (which so many people do). Oh, and the potatoes are good too – I had to remind myself not to eat it all. 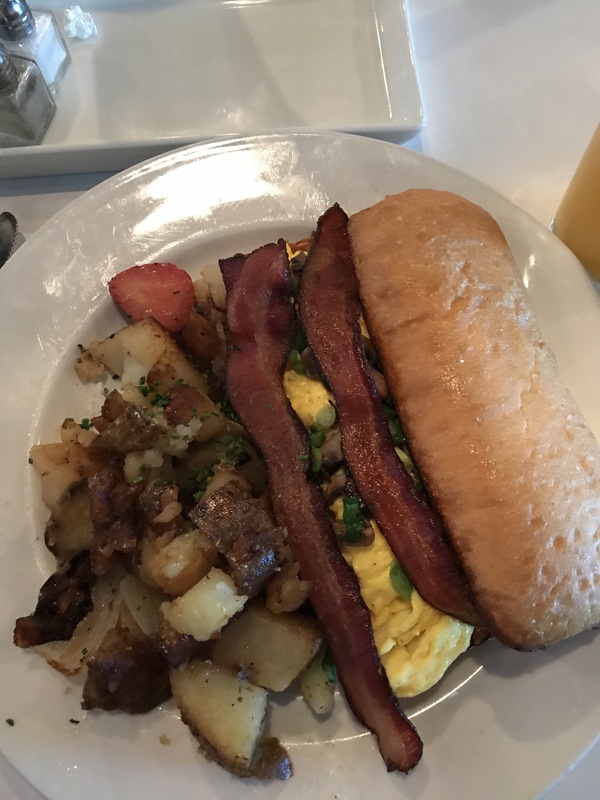 The scramble was really light and the bacon crispy. 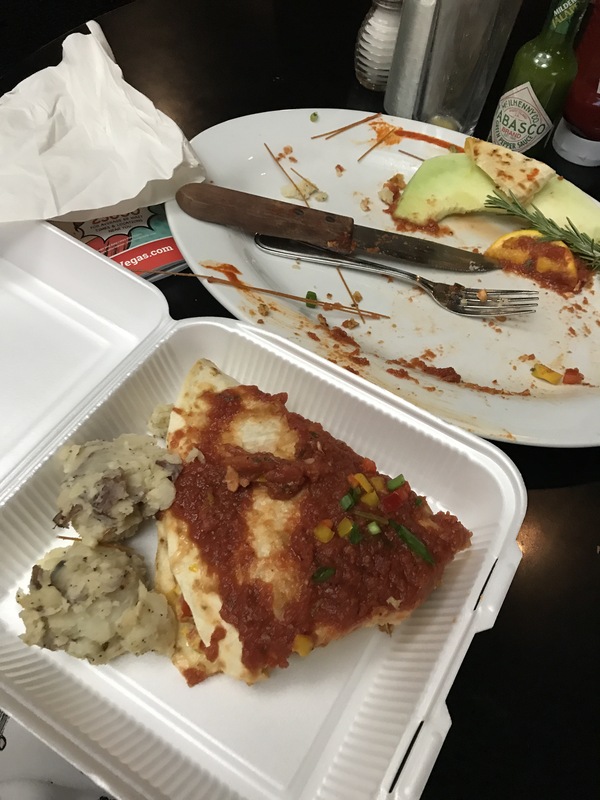 Al went for the hash – if how he devoured it is a sign of anything I’d say it was a winner. Look at the size of those slices of bread as well, and so fluffy! From here if you can brave the heat go for a wander. Next block over is a container park which has a few little shops in it. Out the front is a super cool sculpture which is a monument to love, you’ll want a few pics of that. I didn’t go over this time as I have before but I do love a container park. On the surrounding blocks you will find heaps of murals. 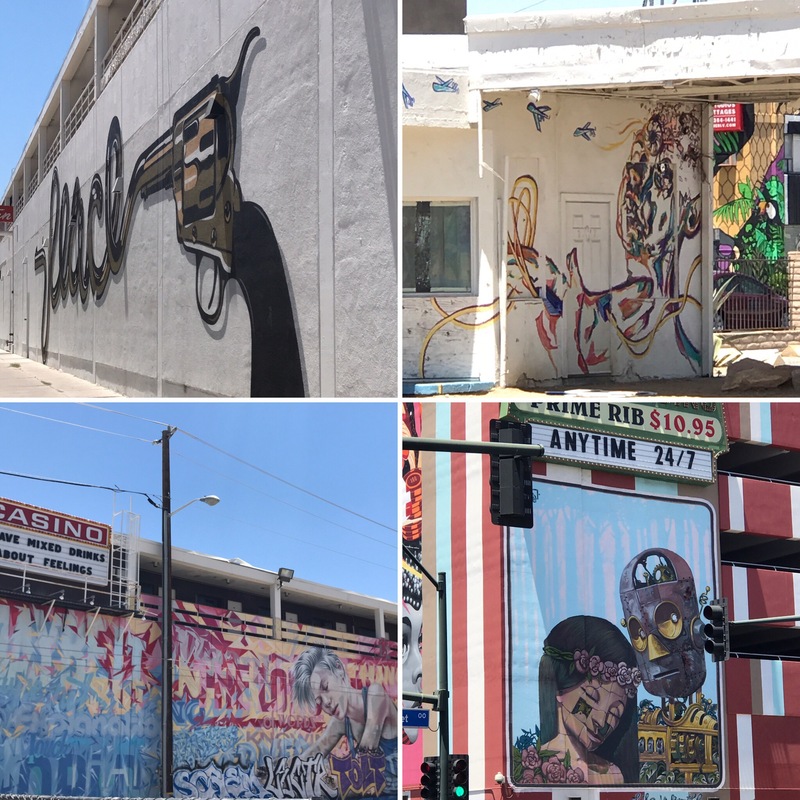 This is Vegas’ arts district, and it is full of colour. After a look at some great murals it’s time to head over to the casinos. The neon work down here is fantastic so it is going to take awhile to get into the aircon as you stop for all of those perfect pictures. And you thought you were just coming to Vegas for gambling! I’m pretty sure I photo’d every possible sign last trip so this time I was able to escape quickly in to the aircon. It was 41 degrees, I think that’s excusable. We settled into the Golden Nugget for a gamble. Here they have a shark tank which has a water slide going through it. I’ve been wanting to go on this for 3 years and never made it! So next time I’m staying down here and making it happen! I’m pretty sure I won’t have to wait too long. Sadly we did not win millions, I was convinced this was going to be the trip that this happened. Oh well, I’ll try again another time.